This book focuses on the diseases, caging, and principally the behavior of one hundred different varieties of hummingbirds. Since it was written in the United Kingdom, I can only assume that that country's exotic animal import laws were considerably more lenient and importers more available in 1982 than here in the United States. 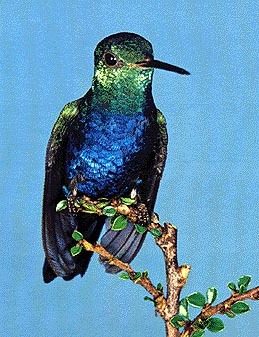 I strongly recommend purchasing a copy of this book to anyone interested in hummingbirds. Even if they are not interested in keeping them, this text is fascinating to read. 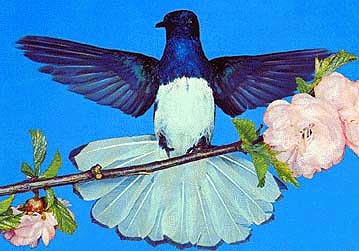 Mr. Mobbs also mentioned that Scheithauer (see below) never bred hummingbirds, a claim I mistakenly make elsewhere in the site. 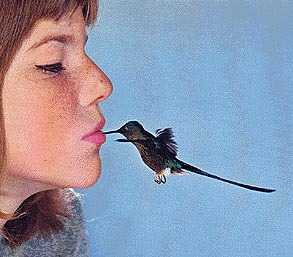 This text contains unequaled information on the dietary requirements of hummingbirds. Mr. Scheithauer's scientific approach to determining the optimum feeding mixture is must reading for anyone interested in keeping these birds. 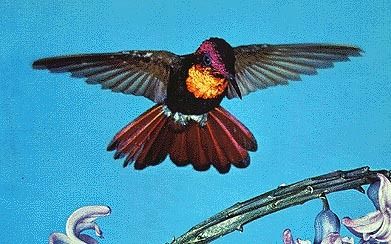 Additionally, he has captured some of the best photographs ever taken of hummingbirds, four of which are reproduced below without permission (I tried and failed to find a point of contact to request permission.) but with the most profound respect to the author and publisher.